Museum Beelden aan Zee was founded by Theo and Lida Scholten in 1994. The collected works, mainly from the second half of the 20th century, focus on the main theme 'mankind'. The five bronze portraits of the current Royal Family are striking examples from the collection. The sculptures vary in size and are made by national and international, established and unknown sculptors. Some of these sculptors are Karel Appel, Jeroen Henneman and Igor Mitoraj. The collection held at the museum includes sculptures produced from a wide range of materials. The museum, designed by Dutch architect Wim Quist, is constructed with sand-coloured materials to blend in with its surroundings. The building, with a basic shape of two large circles, is dug into a dune. From the intimacy of the museum one has a surprising view of sea and clouds: a silent sensation. Besides the presentation of the Beelden aan Zee collection there is a free sculpture garden with 23 groups of fairy tale-like sculptures made by American sculptor Tom Otterness on the boulevard of Scheveningen. 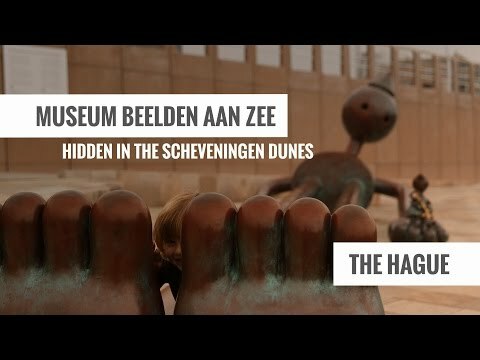 Museum Beelden aan Zee is surrounded by a host of other attractions in Scheveningen, such as The Pier, SEA LIFE, the Circustheater and Holland Casino. The immediate vicinity of the museum offers a wealth of activities for young and old during every season. After a refreshing walk along the beach, drop in at The Pier, restaurants and cafés on the boulevard and the year-round beach clubs to enjoy a delicious dinner with a view of the sea. Nearby SEA LIFE Scheveningen is a must for a day out with children. The Pathé cinema, Circustheater and Holland Casino guarantee a great evening out in Scheveningen. The historic city centre of The Hague is only fifteen minutes from Scheveningen beach!